How Do You Get Narcissists To Care About Other People? Narcissists are notoriously bad at empathizing, often to the detriment of their personal and professional relationships. So how do you get an egoist to imagine himself in someone else's shoes? Believe it or not, it could be as simple as asking him to do just that. Hepper and her co-authors asked a group of 95 female undergrads to take [a narcissism quiz], and then later to watch a 10-minute documentary about Susan, a victim of spousal abuse. Half were told to try to put themselves in Susan's shoes ("Imagine how Susan feels. Try to take her perspective in the video..."), while the others were told to imagine they were watching the program on TV one evening. The subjects who were told to take Susan's perspective were significantly more likely to score higher on empathy. 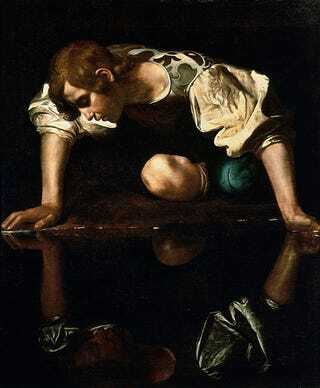 In fact, the more narcissistic they were, the more the trick seemed to work. "I think what's going on here is that people who are low on narcissism are already responding to people—telling them what to do isn't going to increase their empathy any further," Hepper said. "But the higher on narcissism you get, the less empathy [you feel]. By instructing them to think about it, it activates this empathic response that was previously much weaker." Read about the other two components of the three-part study at The Atlantic.